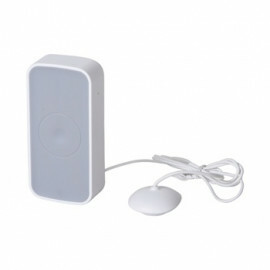 Z-Wave Plus Motion Sensor - SP817 from Everspring. 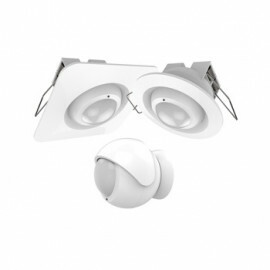 The SP817 Motion Sensor is designed with two detecting sensors, Passive Infra-Red (PIR) sensor and light sensor, in order to fulfill the purpose of security and home automation (can be used as presence detector). When the detector is cooperated with security appliances, it is acting as a security device by detecting changes in infra-red radiation levels. If a person moves within or across the device field of vision, a trigger radio signal will be transmitted to cause full alarm condition in order to frighten intruders away. Alternatively, when the detector is worked with home automation appliances, the detector can be set to perform the role of home automation device by detecting both changes in infra-red radiation levels and percentage of lux levels. Once night falls, the percentage of ambient illumination is lower than preset value. If a person moves within or across the device field of vision, a trigger radio signal will be transmitted to turn ON the connected lightings for better illumination.